Members were in for a treat as well as something completely different this Friday evening, with a demonstration by local artist Bob Morley. 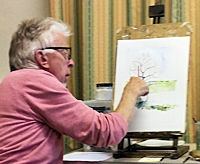 His talk entitled “Working with Emulsion Gouache – a different medium” started with a little artistic history about himself and his transition from watercolour to a gouache/watercolour technique. Bob showed numerous works based on this process ranging from early to current paintings. For those of us who had previously seen and admired his unusual style, this was a real eye-opener to how Bob goes about this type of painting. His works are based on ordinary (Homebase – jokingly) white emulsion, to which he adds watercolour in varying strengths. Starting with a pre-prepared sketch with a little watercolour added, along with a flat plate which had a huge spoonful of thick emulsion in the centre with small amounts of watercolour dabbed from 5ml tubes in a circle around it, Bob showed us first how to mix the two mediums together. It was possible to get quite a large array of tones for each colour using this mixing technique, which could then be applied to the 140lb paper either mixing with wet watercolour on the paper, or going over dry watercolour. This emulsion could be applied in its neat form over a wrong or unwanted existing colour, and then repainted almost straight away! 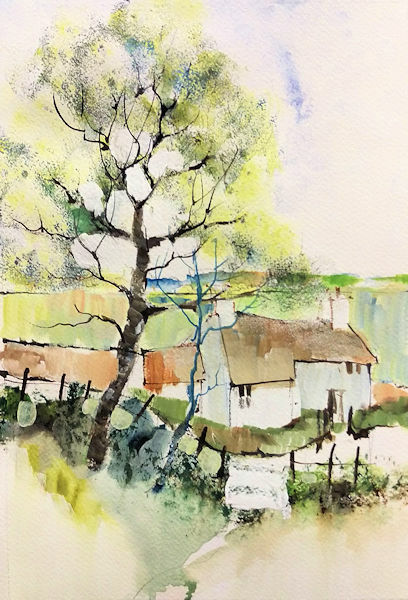 For creating beautiful looking trees, Bob first painted the trunk, branches and twigs, followed by paint with a sponge and watercolour, then neat with emulsion – again using the sponge, then again using different shades of colour. He then repainted some of the branches using a rigger. We were then amazed when he applied neat emulsion with a chisel ended brush between the branches in a negative painting way, to leave white or to re-apply the background colour. Bob demonstrated that any mistakes or unwanted parts could be completely blocked out in this fashion, by emulsioning over part of a hedge to add a gate. The build-up of gouache in this way added a textured look to the finished work. Using gouache and a strong mix of watercolour like this, Bob said that it was possible to get really dark coloured areas in his work, breaking with convention often by using black. Another way that he would break with convention was to use a rigger with a dark tone in a linear fashion to add lines in various places, especially in horizontal strokes, which he explained added a peaceful feel to the work. The evening concluded with us all “having a go” to get first-hand experience with this wonderful technique. Finally, we all got to go home with a handy pamphlet compiled by Bob explaining the technique – no expense spared!